ix+152pp with diagrams. Octavo (8 3/4" x 5 3/4") issued in green cloth with gilt lettering to spine. Translated from the Dutch Veldheerschap op de vierenzestig, The Hague, G B van Goor Zonen, 1966, by W H Cozens. (Betts: 12-12) 1st edtion. By examining the characteristic features of the play of outstanding masters "from Greco to Spassky", the author analyses the ideas of successive periods. The work is in 8 chapters, including 43 games annotated to illustrate his various themes: Excursions with the peices (Greco). the discovery of the pawns (Philidor). Long live combination (Anderssen). Combination for strategic ends (Morphy). 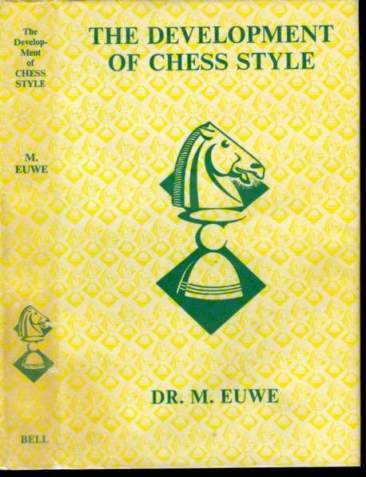 Positional play (Steinitz: his career, his teachings, elucidation of his teachings). Technique and routine (The virtuosi, 1900-1914). The independent thinkers (1919-1940). New thirst for battle (Russian school, 1945-). More than one third of the book is devoted to Steinitz. Jacket light edge wear with small chip at back heal edge. Better than very good in a very good dust jacket.